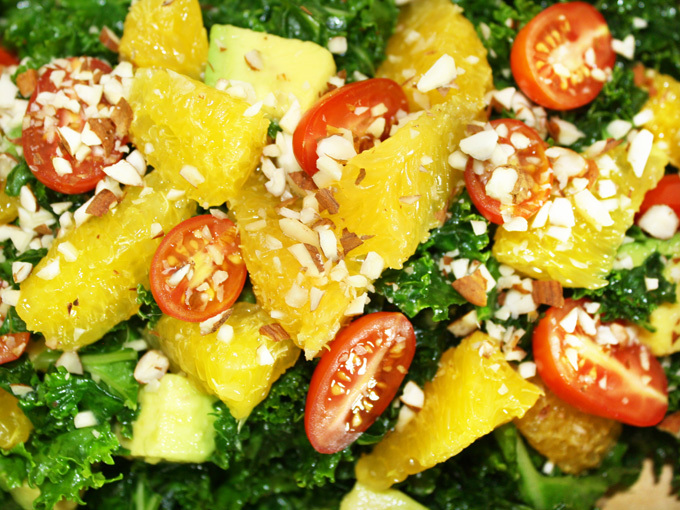 This orange kale salad is a perfect refreshing salad on a hot summer day. The tangy orange dressing paired with the slightly bitter sweet kale, creamy avocado, and the sweet orange segments…mmm. It’s citrus-y goodness in your mouth! And guess what? It only takes about 15 minutes to make! Simple and tasty, that’s how I like it. 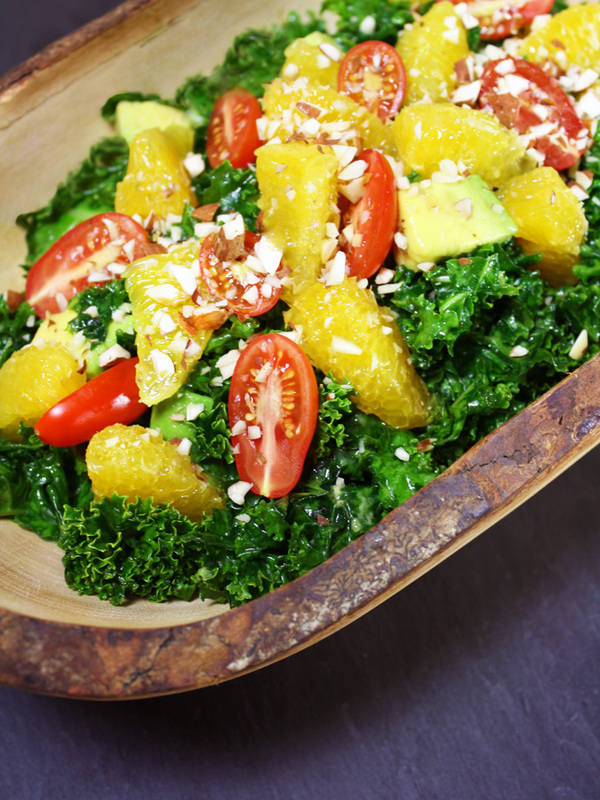 So let’s get started on this delicious raw vegan orange kale salad! First we have to destem the kale. You can easily do that by holding the base of the stem with one hand, and with the other hand, just slide along the stem to strip the leaves off. 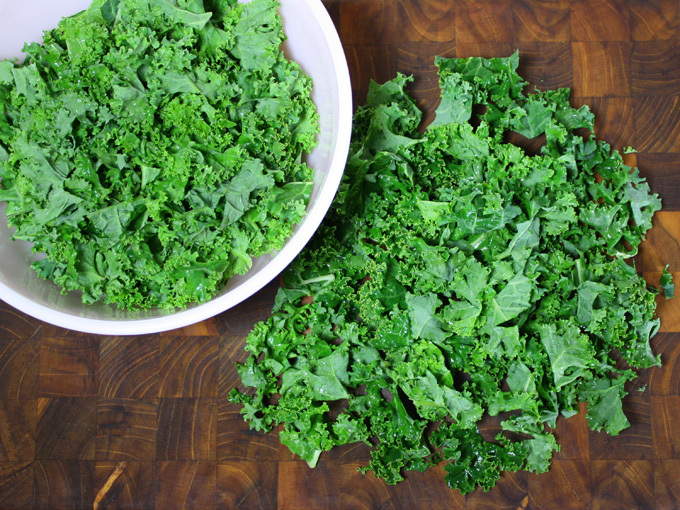 Kale can have some dirt trapped in between the leaves, so wash them well and dry off with a salad spinner. Then, roughly chop up the leaves and place them in a bowl. Once the kale wilts and shrinks to about half the size of what you started with, taste test it to see if the leaves are tender. If they are, you’re done massaging. Cube the avocado, and cut the oranges into bite size segments. 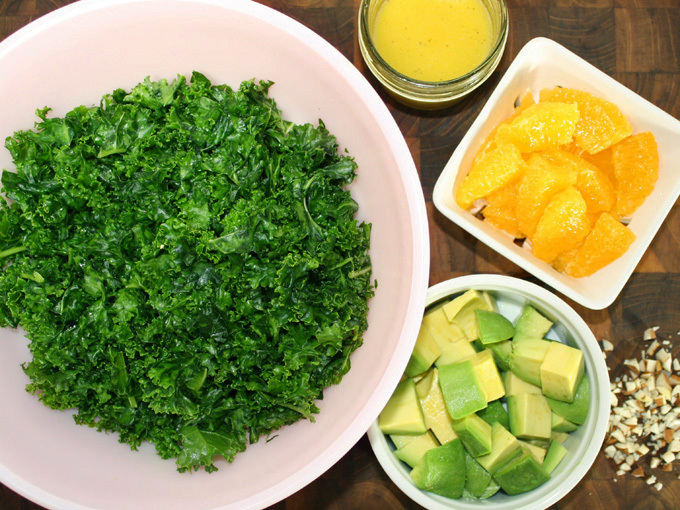 Make the dressing with orange juice, olive oil, salt and pepper and dress the kale. Add half of the avocado and oranges and toss gently. Save the other half for garnish. Plate it and top with the remaining avocado and oranges. Sprinkle some chopped almonds for garnish. You can add cherry tomatoes as I did for the pictures if you like. Look at the vibrant colors! It tastes just as vibrant as it looks, with the burst of sweet and tangy oranges. If you like oranges, you gotta give this one a try! 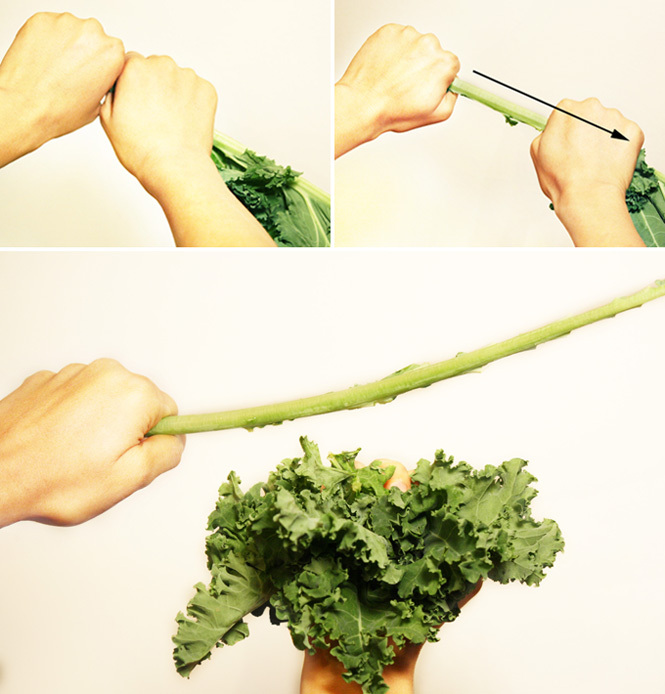 Destem the kale, by holding the base of the stem with one hand, and with the other hand, just slide through the stem to strip the leaves off. Wash them well and dry off with a salad spinner. 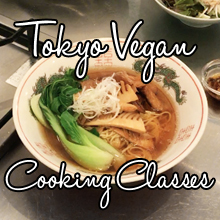 Roughly chop up the leaves and place them in a bowl. Squeeze half an orange to get the juice. 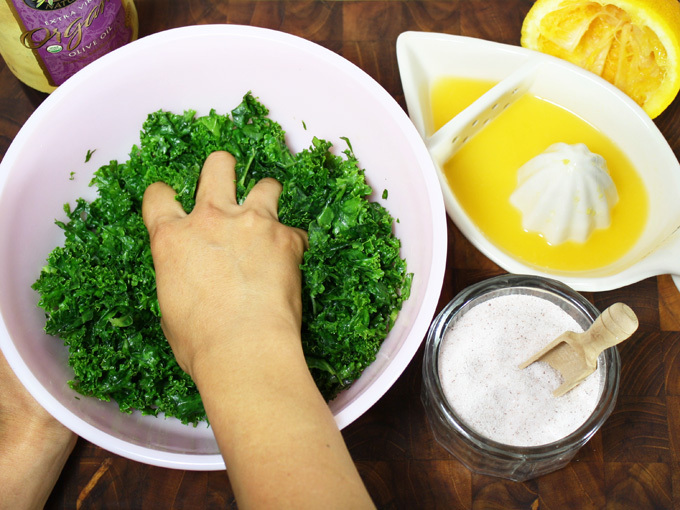 Add a pinch of salt, light drizzle of olive oil, and a splash of orange juice onto the kale. Put some elbow grease in and massage well for about 5 minutes. Once the kale wilts and shrinks to about half the size of what you started with, taste test it to see if the leaves are tender. If they are, you're done massaging. Cube the avocado, and cut the oranges into bite size pieces. Make the dressing with orange juice, olive oil, garlic, salt and pepper, and dress the kale. Add half of the avocado and oranges and toss gently. Save the other half for garnish. Plate the salad and top it with the remaining avocado and oranges. Sprinkle some chopped almonds for garnish. You can add cherry tomatoes if you like as well. If you purchased kale and it started to wilt in the refrigerator after a few days, cut off the base of the stem at an angle and soak it in cool water for 15-30 minutes. It should regain its freshness and crispness.